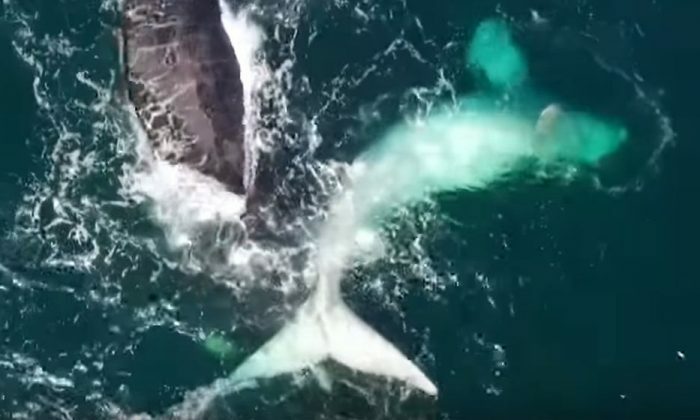 A drone has captured footage of a rare southern right whale calf, which is also albino, with its mother in the southern part of the Atlantic Ocean. “Naturally, I was ecstatic to see them still there, only about 700m from the shore! Any time that someone gets to be in the presence of these magnificent creatures, it is a truly life-changing experience,” Anton Schutte, 42, from Cape Town, South Africa, told Caters News. The drone that captured the footage belonged to him. The video footage comes as researchers have discovered that kelp seagulls are attacking and eating baby southern right whales while they’re still alive. The birds are attacking and eating the blubber from the backs of the animals as they surface to breathe. A researcher said it’s hard to know if the gulls are directly responsible for an increase in whale deaths as 56 percent of calves found dead had wounds from gull attacks. “It is tempting to look at the correlation in time and think the gull-inflicted wounds must be a contributing factor to calf deaths, but despite a lot of work we still don’t have convincing evidence for any plausible mechanism,” Dr. Maron was quoted by MailOnline as saying.